Iron Man has proved its mettle and exceeded box office expectations by taking an estimated $101m (£51m) in its opening weekend in the US and Canada. If the figures are confirmed, the comic book adaptation will become one of only 10 films to have broken the $100m barrier in its first three days. Iron Man stars Robert Downey Jr as the comic book hero, with Gwyneth Paltrow playing his personal assistant. It had been expected to take $70m-$80m (£35m-£40m) between Friday and Sunday. 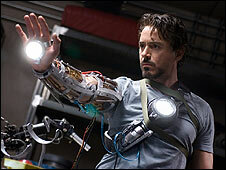 Downey Jr plays a billionaire industrialist who invents a high-tech suit of armour that transforms him into a superhero.